Comprehensive Biochemisty, Volume 5: Carbohydrates deals with the organic and physical chemistry of the major organic constituents of living material. This book discusses the general structure of monosaccharides, detection and estimation of aldonic acids, intramolecular rearrangement of N-glycosides, and preparation of sugar phosphates. The deacetylation of glycoside acetates, naturally occurring oligosaccharides of human milk, and molecular weight of polysaccharides are also elaborated. This text likewise covers the biogenesis and fate of pectic substances in plant tissues, complex polysaccharides of gram-positive bacteria, galactosaminoglycan of Aspergillus parasiticus, and chemical structure of heparin sulfate. 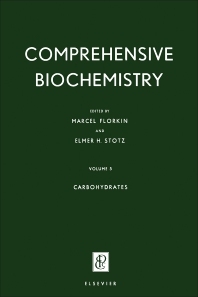 This volume is a good source for biochemists and researchers conducting work on carbohydrates.